February | 2010 | That Mall is sick and that Store is dead! 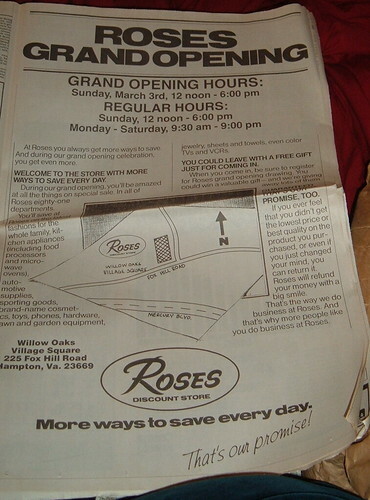 This was a Grand Opening for a Roses store in Hampton, VA about 10 minutes away from my childhood home. It opened in 1991, and closed in 1994 in immaculate collection. Mom and I spent a lot of hours there when my dad was out to sea when I was a kid. It’s now a telemarketing place called West now. I haven’t driven by it in years. I dream about the roads leading up to it all the time however. 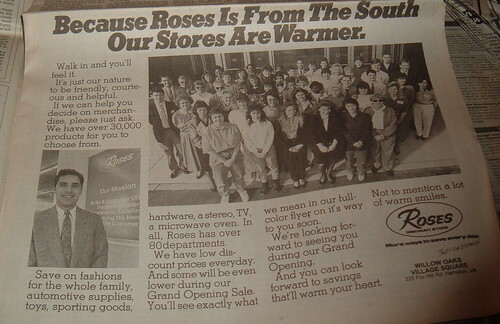 I remember the first time my family went to this Roses, I got these cool marker set that had a white marker that would change the color of the markers? Does anybody know what I’m talking about?